Farmers in Andhra Pradesh’s rice belt have declared a “crop holiday” this season after they suffered losses despite a bumper crop last year. The growers’ loss varied from Rs Rs 2,200 to Rs 3,600 per acre. They have been forced to take the extreme step as paddy cultivation is no longer financially viable. How do inspectors overlook violations? THE explosion in a firecracker factory near Karnal, that claimed at least five lives, besides causing injuries to 15, was a tragedy that was waiting to happen. The factory, running without a “no-objection certificate”, made firecrackers, a hazardous substance, in temporary sheds which did not have the prescribed height. Karachi, Pakistan’s commercial capital, remains in the news mostly for the wrong reasons as it is today. Over 600 lives have been lost in July and August in political-ethnic violence in the metropolis with the people having little faith in the government’s ability to maintain law and order. Immediately after Independence, Lord Ismay, Chief of Staff to Governor-General Mountbatten, was approached by the Government of India to draw up a system for defence management in the country. Ismay, while recommending integrated functioning among the three Services for smooth coordination, also cautioned Pt Nehru not to go in for the position of the Chief of Defence Staff (CDS) to have strong, stable and federal civilian control in the country. I have met Punjabis all over the world. Their upward mobility, ability to make friends and influence people, and practical approach to life are amazing. I was in Peshawar. The man talking to me appeared to be a Pathan. Suddenly, he switched from Pashto to Punjabi and told me that his maternal grandmother was a Kapoor. A few weeks ago I visited one of Mother Teresa’s Sisters who was admitted for surgery in the PGI hospital in Chandigarh. The Chief Secretary of Haryana Smt. Urvashi Gulati and the Secretary to the Governor Mohinder Kumar accompanied me that morning to Sister Ann Vinita’s bedside. Farmers in Andhra Pradesh’s rice belt have declared a “crop holiday” this season after they suffered losses despite a bumper crop last year. The growers’ loss varied from Rs Rs 2,200 to Rs 3,600 per acre. They have been forced to take the extreme step as paddy cultivation is no longer financially viable. The cost of farm inputs, including seeds and chemicals, has soared by up to 300 per cent in the last two years in the state. Secondly, migration to cities has led to a shortage of labour, which, in turn, has pushed up farm wages. The minimum support price at Rs 1,030 a quintal has proved inadequate to cover the rising costs and even this price is not available to a large number. In Andhra Pradesh there is no assured procurement of paddy as in Punjab and Haryana. Private mills buy paddy in a big way. Since private rice millers could not offload their existing stocks to generate money for fresh paddy buying and the government added to their woes by delaying a decision on exports, rice growers did not get the MSP and had to resort to distress sale. Many dumped paddy for just Rs 700 a quintal. There were not even enough bags for self-help groups, which procure rice under a poverty reduction programme to help the rural poor. While the poor lack access to affordable food, vast quantities of food rot due to poor storage. The government does not seem to know how to handle a glut. A large majority of people dependent on agriculture face a threat to their livelihood as returns from farming decline and costs escalate. Farm labourers move to cities in search of better work. Daily wages back home rise, eating up a larger slice of farmers’ revenue. A team of experts led by M.S. Swaminathan has studied various aspects of the deepening agricultural crisis, but their reports gather dust as the governments in states and at the Centre have other priorities. THE explosion in a firecracker factory near Karnal, that claimed at least five lives, besides causing injuries to 15, was a tragedy that was waiting to happen. The factory, running without a “no-objection certificate”, made firecrackers, a hazardous substance, in temporary sheds which did not have the prescribed height. Fire-fighting arrangements were inadequate and equipment non-functional. Not only that, it also employed children in violation of laws. Still, it was allowed to run for full eight years. Ironically, it was inspected in August last year but the inspectors did not find anything amiss. How the inadequate height of the shed and other details escaped their attention defies comprehension. It was challaned several times earlier, but never sealed. Those who allowed it to run without valid documents and safety arrangements are as guilty as those who operated it. Nor is this a rare case. There are several such factories functioning in or close to densely populated areas. There was a similar blast in a firecracker manufacturing unit in Fajjupur near Gurdaspur in January which had claimed six lives. As is usual in such cases, an investigation was immediately ordered but after that nothing much was heard about it. There are inspectors galore to curb illegal activities. But they add to illegalities by looking the other way after being sufficiently “compensated”. Not only does such corruption cause horrendous accidents, but it also shakes the faith of the public in the administration. The anger that the ministers and others show after a tragedy should be on display when violations are taking place. Locking the stables after the horses have bolted has never worked. Then there is also the issue of compensation to innocent victims. The administration generally tends to be miserly. The amount that it pays to the poor people for their monetary loss is not enough to cover even a fraction of the damage suffered. Karachi, Pakistan’s commercial capital, remains in the news mostly for the wrong reasons as it is today. Over 600 lives have been lost in July and August in political-ethnic violence in the metropolis with the people having little faith in the government’s ability to maintain law and order. Paramilitary forces have launched a major operation to restore order, but it is doubtful if they can succeed in a politically charged atmosphere. The Muttahida Qaumi Movement (MQM) has demanded the deployment of the regular army to prevent more killings. The PPP, which leads the ruling coalition in Islamabad, and the PML(N) of former Prime Minister Nawaz Sharif are opposed to the idea of seeking the army’s assistance for political reasons. Interestingly, however, what the MQM wants has been backed by the Pakistan Army Chief, Gen Ashfaque Parvez Kayani. Under similar circumstances in the late eighties the army had to be called in to restore order in Karachi. How far the government is able to resist the demand for deploying the army now remains to be seen. But ethnic polarisation in this biggest city of Pakistan is getting sharper with each day passing. The tribal Pathans, whose roots lie in Balochistan and Khyber-Pakhtoonkhwa, are at daggers drawn with the Urdu-speaking migrants from India, the Mohajirs. Their enmity is not new, but it has again come into the open today with the MQM leading one camp and the Awami National Party (ANP) of the Pathans backing the other camp. Though the trouble began with the kidnapping and murder of five Baloch residents of Karachi a few weeks ago, tension had started building up after the revival of the Musharraf-era local government system in Karachi and Hyderabad, dominated by Mohajirs, understandably under pressure from the MQM. It is believed the PPP-led government in Islamabad brought about this change recently to mend fences with the MQM, which had withdrawn from the ruling coalition some time ago. The prevailing commissioner system had the support of the tribal population and the ethnic Sindhis. Thus, the violence in Karachi may influence the course of politics in Pakistan. Immediately after Independence, Lord Ismay, Chief of Staff to Governor-General Mountbatten, was approached by the Government of India to draw up a system for defence management in the country. Ismay, while recommending integrated functioning among the three Services for smooth coordination, also cautioned Pt Nehru not to go in for the position of the Chief of Defence Staff (CDS) to have strong, stable and federal civilian control in the country. It was, however, taken by the successive governments as a quote from the Bible. Ironically, after over five decades the Kargil Review Committee and later a Group of Ministers suggested that the capability of the armed forces could be enhanced significantly if they operated with a high degree of jointness. Modern warfare demands a much higher degree of coordination in operations by the various Services. The creation of the CDS may promote greater jointness in the armed forces. The key recommendation of the GoM on jointness included the restructuring of the Services headquarters with the Ministry of Defence promoting a single point military advice, management and control of nuclear weapons and strategic forces, enhancing efficiency and effectiveness of the planning process, technical and commercial evaluation of capital schemes and optimising the use of training and other resources in the Services to ensure economy in expenditure. While the GoM asked for the enhancement of jointness in the armed forces, it also suggested even the cross-posting of officers in operations, intelligence and planning directorates. At the same time, the GoM recommended the creation of an Andaman & Nicobar Command, a strategic forces command, a defence intelligence agency and a defence procurement Board. Later, however, all recommendations except those pertaining to the CDS were approved by the Cabinet Committee on Security on May 11, 2001. In the case of the CDS, the Cabinet Committee on Security opted for wider discussions with various political parties before taking the final view. Instead, the HQ Integrated Defence Staff was raised on October 1, 2001, providing staff support to the Chief of Staff Committee. Military jointness is not a new concept. It has only come under focus again. The reasons for this include shrinking wars, an extended period of mobilisation, rising defence budgets and the lack of interoperability and the dominating Service ethos. As regards promoting military jointness, the most significant thing is training and preparing the mindset to overcome some of the inherent fears like the Services redundancy, presumably linked to the appointment of the CDS. It may be pointed out that nearly 66 countries are having joint command structures. In most of the western democracies like the US, the UK, France, Germany and Italy as well other nations of consequence in the Asia-Pacific region like China, Japan, Indonesia, Malaysia, Singapore, Thailand and Sri Lanka, there is a duly appointed Chief of Defence/General Staff enjoying full confidence of their respective Head of State or Goernment to whom they directly report. There can be no better way of ensuring supremacy and control or the civilian authority over the military. On the other hand, countries not having opted for the CDS system are of little consequence. Some of them do not ever possess the armed forces sufficient to undertake the regular defence requirements. At the same time, countries like Saudi Arabia are considering military jointness as a necessity. India, on the contrary — possessing the third largest army, the fourth largest Air Force and the sixth largest Navy — has remained averse to military jointness and to the institution of the CDS. It may be interesting to know that after 1971 war, Indira Gandhi offered the then Army Chief, the late General Manekshaw, the position of Chief of Defence Staff. Later, when consensus was sought by the then Defence Minister from the other two Chiefs the matter got aborted. During NDA rule the long-awaited integration of the three Services got shelved due to the indifference shown by the Services. This attitude, however, goes contrary to the belief otherwise expressed by the defence services for the Chief of Defence Staff. All nations practising jointness of the armed forces provide single window advice or, more correctly, a synergised institutional opinion. The CDS system is considered essential for the armed forces the world over and India is no exception. The future operating environment will need the application of military power in a small incremental manner which, in turn, will require the achievement of joint synergy at all levels. There is, therefore, much scope in having a joint service, said the US Defence Attache in India. The joint command is multi-service in nature, much better and cost-effective. For instance, a joint assignment is mandatory for getting a one-star appointment in the US defence forces. The creation of a joint defence structure does not mean abolition of the authority of the Service Chiefs. Their significance lies in maintaining the Service character, ethos and training, and being force providers for facilitating joint operational engagement, which itself is a full-time job. However, keeping in view the inter-Services conflict in India that may arise from the appointment of the CDS, the most desirable course would be to adopt a power-sharing mechanism. The writer is Professor and Chairman, Department of Defence and National Security Studies, Panjab University, Chandigarh. He was also a member of the National Security Advisory Board. I have met Punjabis all over the world. Their upward mobility, ability to make friends and influence people, and practical approach to life are amazing. I was in Peshawar. The man talking to me appeared to be a Pathan. Suddenly, he switched from Pashto to Punjabi and told me that his maternal grandmother was a Kapoor. He narrated his visit to Bombay and meeting Raj Kapoor, who belonged to Peshawar. He recounted how Raj Kapoor met him warmly and introduced him to all the leading heroines. He excitedly told me that all the women appeared to be in “Ishq” with Raj Kapoor. When I told him that I had only one ‘Aurat’ (wife), there was a perceptible dip in respect for me in his eyes. Punjabis are fond of good things of life. I had once asked famous music director O.P. Nayyar as to what he loved the most, after music. Pat came the reply: “Sharab, Shabab aur Kabab” (liquor, women and non-veg food). I met a leading Punjabi film star in London. In spite of his years, he looked charming. I asked him the reason of his ‘Husno-Shabab’. Three things, he said: “I eat very little. I do not drink. I do not take things to heart, both literally and figuratively. Some films did well, the other did not. Several affairs and heartbreaks” (kai var dil lagaya, kai var dil tutya). He said Punjabis had three traits. “They are very good looking as you can see in the film industry. They can adjust anywhere; that is why you find them in all parts of the world. Punjabis are neither moral nor immoral, but ‘amoral’. They believe in ‘jugad’. A Punjabi can do well anywhere from the underworld to the art world”. Punjabi music has taken over Bollywood. Punjabis have made a name even in Hollywood with people like Mira Nair and Shekhar Kapoor registering their presence. Punjabis all over the world have done very well. America has two Punjabi Governors. The UK has two Punjabis in the House of Lords. Southall is an extension of Punjab. Canada has a number of Punjabi MPs. Punjabis have a strong sentimental side. Whether in London, Switzerland, Kenya or Las Vegas the longing for their ‘pind’ (village) always surfaces. Some of us were sitting in ‘Moulin Rouge,’ the most expensive joint in Paris. The best food, glamorous dancers, and suddenly the conversation turned to ‘makki di roti and saag’ and ‘bebe de hath di tandoori roti’. I attended a concert in Toronto, where a singer from Punjab sang ‘Tusi Vasde Raho Pardesio, Tuhade Naal Vase Punjab’. I could see a large number of moist eyes. A few weeks ago I visited one of Mother Teresa’s Sisters who was admitted for surgery in the PGI hospital in Chandigarh. The Chief Secretary of Haryana Smt. Urvashi Gulati and the Secretary to the Governor Mohinder Kumar accompanied me that morning to Sister Ann Vinita’s bedside. Attending to her in the hospital were two companion Sisters of the Missionaries of Charity. In the course of conversation, one of them said that she was really happy to meet me. She went on to explain that as a young woman in Kerala, she had admired Mother Teresa’s work , but it was when she chanced to read my biography of Mother Teresa that she decided to join the Order. That a young Catholic woman should have read a book written by one, who while he was unmistakably close to Mother Teresa, yet did not share her faith stunned me into silence. It made me reflect on a number of issues related and unrelated: of the strength of secular values; and of true compassion knowing no religious, ethnic, caste or geographical boundaries, and indeed being able to transcend altogether the formal contours of religious practice. Mother Teresa was a tiny figure who strode her century like a colossus, and in the process made her name a synonym for goodness and compassion the world over. She was invariably received in the halls of power, but her mission lay in the meanest streets and slums over all the continents. She built brick by brick, a global infrastructure with the help of five thousand Sisters and Brothers of her Order, and also had the capacity to enjoin millions of ordinary people, who came forward to help her in her mission to alleviate loneliness, hunger and suffering. By the time she passed away in 1997, she had established a multinational organisation that operated in over 123 countries and served her special constituency of the destitute, the abandoned, homeless, hungry and dying. In the process she became one of the principal conscience-keepers of her time. 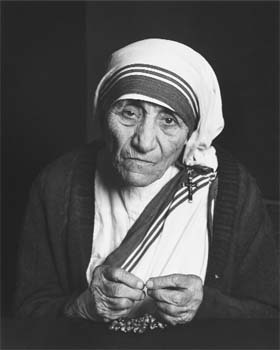 I first met Mother Teresa, 36 years ago in 1975. That meeting remains indelibly printed on my mind. That morning I had accompanied Delhi’s Lieutenant Governor, with whom I was then attached, to her home for the destitute. I was taken aback when I came face to face with her. She was smaller than I had imagined, dressed in her trademark, hand-woven sari with three blue stripes that was neatly darned in several places. I noticed her back was bent even then. Her feet were twisted and her hands were gnarled, testimony to her arduous life in the slums. That morning, as on many other occasions where I heard her, she spoke of simple things: of loving, caring and sharing. She seemed at many levels a very ordinary woman. Yet she was a powerful communicator who reached the hearts of those who listened to her. My overwhelming thought that morning was that there was very little difference between the poor whom she and her Sisters served, and their own vow of poverty. As I reflect on her life, I find there were several mysteries that lend themselves to no easy answers. Mother Teresa was hardly qualified in academic terms. She never went to a university and her studies were largely confined to the scriptures. And yet she set up hundreds of schools that lifted poor children from a desolate life on the streets. She provided a safety net for the homeless by opening centres and soup kitchens. She started Shishu Bhavans for abandoned infants. There were homes for the terminally ill, so that they were not alone when they died. Not all these centres were in the poorer parts of the world; many were in the affluent west where loneliness and despair were a sickness she likened to leprosy. The early faltering steps, too, were a mystery. What a strange sight she would have presented on the streets of Kolkata in 1948. A European nun not clad in a familiar religious habit, but in a cheap sari similar to those worn by the municipal sweepresses, her feet encased in a pair of rough leather sandals: a nun in her belief and vows, but not in appearance. She was alone. She had no helper, no companion and carried no money to speak of. She stepped into a city in which she had taught long years but of which she knew nothing. She taught herself to beg, the ultimate humiliation for one whose life had been secure, though not even remotely luxurious. In her only diary, which I was privy to, she wrote of her struggle between her faith and the temptation to return to the security within the convent walls. She proved to be an excellent administrator and soon discovered she could multi-task. She had the unerring instinct of realising who could help her in her task, in the shortest possible time. She started her first little school in a Kolkata slum in 1948, determined to teach the little children who ran out to greet this stranger in their midst. With no blackboard, nor table and chairs, she simply picked up a stick and inscribed the Bengali alphabet on the mud. Gradually more children gathered around her. People recognised her goodness; someone contributed a chair, another a desk. Teachers volunteered to teach; soon the little school became a reality. But this little school was good only for one slum. Soon she started another in a different locality. This was followed by a dispensary, another school in another slum of the city. She had discovered that she could multi-task. She encouraged lay persons and community workers to join hands with her. Teachers volunteered, doctors came forward offering free service, chemists donated medicines. In this way, she formed a human chain of millions the world over. Many years later, but in much the same spirit, I was to see the start of a soup kitchen in North London. The bishop had offered her a derelict church. Her Sisters went from shop to shop in the neighbourhood to beg for vegetables and food. Within a week shopkeepers themselves came forward to deliver their surplus. Cooks and helpers volunteered their services. Soon, on an average day, the Sisters fed 500 of London’s poor their only hot meal of the day. She founded her religious order with a special vow—to serve only the poorest of the poor. Having witnessed the growth of her congregation, I was anxious how the Missionaries of Charity, which had created a presence in 123 countries by the time she died, would survive after Mother Teresa passed on. She was charismatic and the funds flowed in plentifully, helping her to expand her work to over 600 branches for the destitute, orphans and children, old age homes, crèches, leprosy stations, AIDS hospices, feeding centres and schools all over the world. She once told me that as long as her Mission served only the poorest forms of destitution, the work would continue. Today, I notice no signs of its abating. In fact the Missionaries of Charity today have a presence in 135 countries, where poverty, destitution and loneliness are constant companions in rich and poor societies alike. As a Hindu, armed only with a certain eclecticism, I found it took me longer than most to understand that Mother Teresa was with Christ in each conscious hour, whether at Mass or with each of those whom she tended. The Christ on his crucifix was no different from the one who lay dying at her hospice in Kalighat. There could be no contradiction in her oft-repeated words that one must reach out to one’s neighbour. For Mother Teresa, to love one’s neighbour was to love God. This was what was essential to her, not the size of her mission or the power others perceived in her. “We are called upon not to be successful, but to be faithful,” she explained. Mother Teresa exemplified that faith—in prayer, in love, in service and in peace. At the age of 17-18, she joined Sisters of Loreto, an Irish community of nuns. She taught Geography at St Mary’s High School, Calcutta till 1948. She was allowed to leave the Convent to work in slums. When she was given the Nobel Peace Prize in 1979, she insisted that the formal banquet be dispensed with and the cost handed over to her so that she could feed the poor.